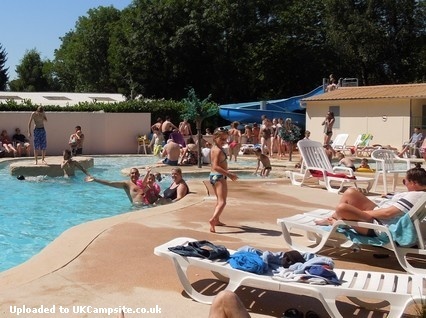 This family campsite is an ideal base for your stay. Located 25 minutes from Disneyland and the Paris Metro, you can also visit other local attractions like the Parc Asterix, the medieval city of Provins, the Chateau de Vaux le Vicomte said the "little Versailles," the Big cats park or to do shopping in the shopping center of Val d’Europe. It is a place of relaxation and rest busy days on the outside. You will appreciate to relax by the pool, fish carp and trout in the ponds or quietly take a drink at the bar, on the terrace in a green place. Paris is only 1 hour from the site in car or 25 minutes from the first metro station, with its abundance of famous museums, attractions and shops. The two theme parks at Disneyland Paris are only a twenty minute drive from site. Visit the lights, camera and action of the new Walt Disney Studios park or visit old friends at Disneyland. Easy, kennels for dog are proposed at the entry of the park.Park of cat-like at 10 minutes. RN 4 exit in Fontenay Tresigny, direction to Coulommiers. In Touquin to follow Les Etangs Fleuris. Campsite at 2.5 km of the village.